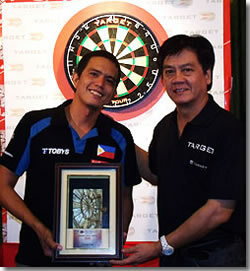 Congratulations to Christian “Ian” Perez for winning the 2011 Philippine Qualifier to the World Darts Championship (PQ-WDC) last November 6, 2011 at the Nu Grill, hosted by Jojo Claudio of Quorum International. Ian won the Philippine Qualifier, going through three (3) very tough matches in the step-ladder finals. The PQ-WDC started with twenty six (26) players divided into four (4) groups from which the top 4 of each group advanced to the round of 16 in two (2) groups of eight (8). The top four (4) finishers in each group advanced to the last round-robin of eight players to determine the top four (4) ranked players. The step-ladder began between 3rd placer Ian Perez and 4th placer Andy Villamor, the runner-up in last year’s PQ-WDC. Ian won 2-1 sets in the best of 3 sets best of 5 legs match. In the 2nd match, Ian beat 2nd ranked player Boy Gionzon, the PQ-WDC last year, in a nerve racking decision set in the ultimate decision leg. Finally, Ian overcame the twice to beat advantage of long-shot Bong Gabiana in an identical 2-0 sets twice to wrap-up a come from behind victory. The PDC World Darts Championship, held at the Alexandria Palace in London, is the richest and most prestigious dart tournament in the world. In 2009, Ian won the Philippine Qualifier for the first time and ably represented the Philippines, being the only Filipino player who has so far won a match in this tournament. Ian Perez hails from Koronadal, South Cotabato, where he graduated with a BS Agriculture Major in Plant Pathology from the University of Notre Dame, in 2002. Ian Perez is a Robson Sportscraft player in the last 14 years and the currently number 1 ranked NDFP player. He is the 1st Youth Champion of Darterong Pinoy in 1998, the runner up to John Part in the 2009 Shanghai Open and champion of the recently concluded Darterong Pinoy, Robson Summer Dartfest, Tinalak Open and 1M Pacman Dart Tournament. We all wish Ian Perez all the best! copyright 2005 - 2011 www.ndfpdarts.com All Rights Reserved.